I became interested Sherlock Holmes mostly through Laurie King’s Mary Russell/Sherlock Holmes series. Prior to reading those books, I’d read maybe a handful of Conan Doyles’s short stories and The Hound of the Baskervilles. But I’m enjoying slowly working through the originals. This, the second collection of stories, contains 11 “Adventures,” to use Watson’s terms. (The UK version includes 12.) Each stories, with one notable exception, includes some sort of puzzle to solve, whether it’s the disappearance of a horse and the death of its trainer or the apparent imprisonment of a Greek man and his sister. As always, Holmes relies on his keen sense of observation to determine what’s really going on. With one notable exception, I don’t think any of the stories in this collection are especially well known—at least I hadn’t encountered references to them before. This is the collection where Mycroft Holmes is introduced (in “The Adventure of the Greek Interpretor,” one of the weaker mysteries in the collection). There are a couple of stories from early in Holmes’s career, and Watson presents them as told to him by Holmes. One of these “The Adventure of the Musgrave Ritual” was among my favorites in the collection — it’s just so dark! Another of my favorites was “The Adventure of the Yellow Face,” not because it’s a particularly good mystery, but because it’s both sweet and sad. From the title, I expected something altogether different, and I was pleased with the direction the story took. Conan Doyle is not always great on issues of race, but this is a nice story. The most important story in the collection, however, is “The Final Problem,” which is the story in which Conan Doyle attempted to retire his famous character to the waters of the Reichenbach Falls. I knew how this story would end, but I’d never read it. In the story, we meet Moriarty for the first time, although we only get a glimpse of how he operates. 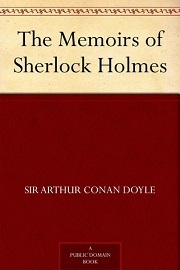 He seems to be tailor made simply for the purpose of bringing Holmes’s career to a noble end. It would have been fun to see more of him. I understand he’s mentioned in later stories, but doesn’t play a direct role in many of them. I’ll enjoy looking for those references as I read more! This entry was posted in Classics, Fiction, Mysteries/Crime, Short Stories/Essays. Bookmark the permalink. These are the stories I read when I need some comfort. They always come out the same way. Mysteries are great comfort reads. I often find them more comforting than “lighter” books because they acknowledge the darkness while providing resolution. My two favorite stories are “The Adventure of the Dancing Men” (which explores the frequency of occurrence of different letters in the English language), and the one, I can’t remember which, in which Sherlock Holmes (if I’m remembering it correctly) teaches Watson about how to forge a signature by turning it upside down and drawing it rather than trying to copy it right-side up. When my brother and I were younger, we tried this (in a non-nefarious way, of course), and it really does work, though usually the characters come out slightly larger and more “open” in construction than those in the original signature. Good thing Sherlock Holmes wasn’t a criminal. And I guess these two stories fed my basic interest in codes, letters, and words themselves, as entities. I must’ve re-read all of the Sherlock Holmes stories about 20 times between the ages of 12 and 25, and every now and then, I dig out my huge Holmes edition and read them again. Good thing you did this post! It reminds me that it’s about time for another read-through (or failing that, Father Brown). I don’t think I’ve read either of those stories! Something to look forward to. I’ve read a smattering of Father Brown as well, but it’s been ages.